Scientific noun: Citrus X limon (L.) Burm., Citrus limonum Risso. 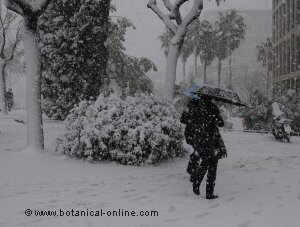 Habitat: Cultivated because of its fruits and as a garden tree in warm Mediterranean places next to the sea. 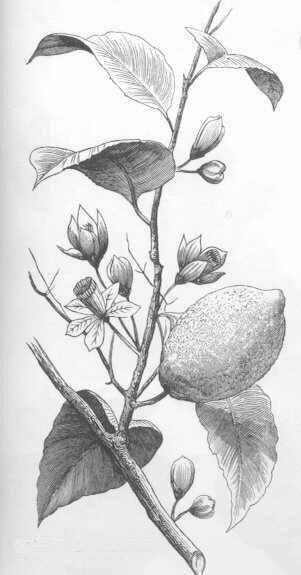 It probably descends from the species ” Citrus medica L. “, native from India. Perennial tree of the Citrus family – rutaceae- up to 3 m. Toothed, elliptical or lanceolate leaves, pointed. Flowers white inside, rosy at the margin of the petals. The fruit is a hesperidium till 12,5 cm. 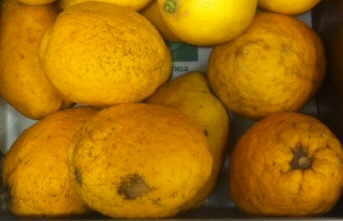 wide, with a thick rind, dark yellow when fully ripe. 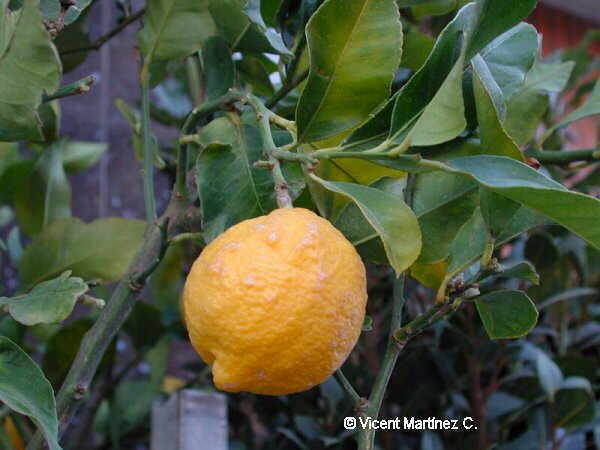 – Flavonoids: hesperidoside, limocitrin in the pericarp of the Spanish lemons. – Minerals: potassium and calcium. – Antiescorbutic and vitaminic: Very rich in vitamin C, reason why it’s got fantastic antiescorbutic properties, with a high content in potassium and calcium. Its potential to regenerate white corpuscles, makes it very desirable to strengthen body defences, preventing many diseases to appear. – Antimigraine: By constraining the pericraneal blood vessels, caffeine, besides being a stimulant, relieves headache, resulting specially interesting with migraine. Caffeine is a component which appears in this plant with a high proportion and can also be found in the greatest proportion in tea and other plants as cocoa (Theobroma cacao L), cola (Cola acuminata), and coffee (Coffea arabica L.) and in the flowers or leaves of some citrics, such as the orange (Citrus sinensis (L.) Osbeck). – Depurative: Ascorbic-acid and lemonene confer it depurative properties, so that it is an excellent remedy against rheumatism, arthrosis, arthritis, gout, cholesterol, arteriosclerosis and uric acid. To combat these diseases it is very useful the lemon diet which consists in drinking the juice of a lemon diluted in water. Increase progressively the dose by adding a daily lemon till reaching 11 or 12. Revers the process till one daily lemon. – Sedative: Lemon juice combined with a couple of tablespoons of honey mixed in warm water before bedtime can help fall asleep. This is a good treatment against insomnia. 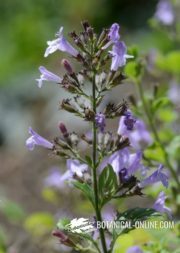 – Respiratory tract diseases: In respiratory affections, the essential oil components confer it antibacterial and expectorant properties, very useful to heal colds. Alpha- pinene is an anti-influenza component so that it is very adequate to drink lemon juice when having this disease. 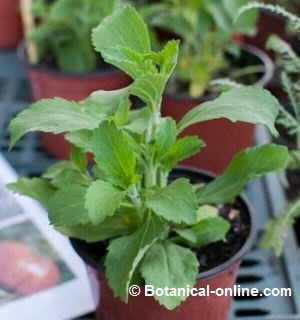 It is also very useful to appease thirst and remove fever. Although vitamin C does not cure flu or common cold, it can relieve their symptoms and reduce their duration. Citrus fruits (oranges, lemons, grapefruits, limes, mandarines, etc.) are good sources of this vitamin. – Circulatory system diseases: Besides being a good cardiac tonic, it helps in blood circulation, prevents cholesterol, decreases hypertension and combats arteriosclerosis, angina pectoris or heart attack. 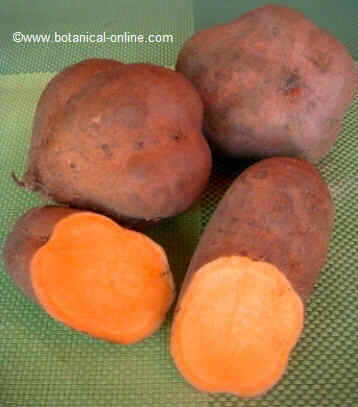 It also stimulates the formation of red corpuscles, being very fitting in anemia. – Diuretic: Because the stimulation power of caffeine and the ascorbic acid, it can be used as a diuretic in obesity treatment, by increasing micturition which will get rid of undesirable water. Lemons, oranges, grapefruits, limes and other citrus contain a high amount of citric acid. It has been proved that this acid is able to dissolve little kidney stones or prevent their formation. Eating this type of fruit protect us against forming new kidney stones. 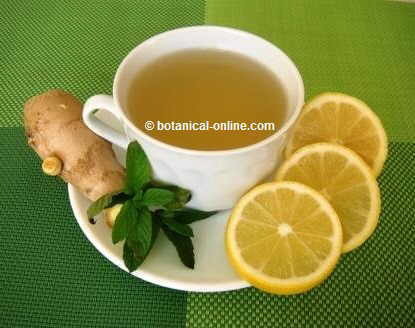 (Drink lemon juice at will) This will also be a preventive remedy to avoid gallbladder inflammation. 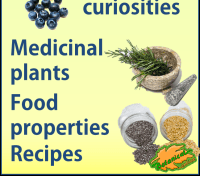 – Anticancerigenous: The main components of essential oil, previously possess anticancerigenous and antitumoral properties, preventing the formation of cancerous cells and helping the body not to develop metastasis once the disease has appeared. Lemon juice has been recognised as a good antioxidant and alkalinising, so it contributes to reestablish cell equilibrium. Lemon has very prominent antibacterial components, moreover, lemon and ginger, served piping hot, help thinning your sinuses and reduce fever, especially if you add a spoonful of honey, So this mix is very useful for sinusitis. Lemon is rich in vitamin C. It is recommended to squeeze lemon juice into salads, infusions,etc. – Skin diseases: Lemon juice is very suitable to fight skin disorders, being one of the best astringents. A couple of daily applications on the skin help it to get rid of oily skin, skin spots, pimples, face spots, scabs, eczema, etc. 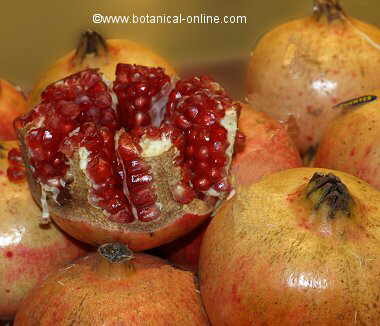 Alpha- terpineol and ascorbic acid give this fruit vulnerary properties, very useful in healing wounds or scars, even insect stings (Use the juice or the essence diluted in water) (For eczemas you can apply a cataplasm with lemon juice and olive oil) Excellent bactericidal mouthwash can be made with fresh juice to cure mouth ulcers. (Another interesting preparation is to mix a few drops of lemon with a tablespoon of warm honey and a yogurt. Mix well and apply a cream on your face for ¾ hour. Then, wash your face with cold water) You can also use it to make wrinkles masks. A good way of regenerating the nail, making them stronger, is by means of nail baths in lemon juice for some minutes every day in the morning and before going to bed. – Tonsillitis and otitis: Before the appearance of tonsillitis or sore throat, it can be useful to carry out gargles with the juice. In the same way, we can use lemon juice applied with a soaked cotton inside the ear when we feel pain in this area because of otitis. In the kitchen lemon is used to decorate and to perfume many plates. It is used habitually in this way with fish and with salads. Cut the lemons in two. Squeeze them and pour the juice in a jar. Strain the juice and add the sugar and the water. Stir it well and serve cool. Nutritional composition of lemons per 100g. Folic acid (mcg) 11mcg. 11 mcg. We can use the lemon juice or the pulp of the fruit like a product for cleaning, substituting the chemical products. Among these reactions we find pocks in the lips or dermatitis in those external parts of the body that have entered in contact with the juice. It is then convenient not to drink lemon juice if we will be exposed to very strong radiations or if we are allergic to their components. 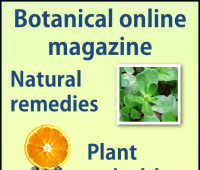 The essential oil is also contraindicated during pregnancy and nursing. The lemon juice is dangerous for the teeth because it attacks the dental plaque and it can yellow it. A good solution to avoid it consists on drinking it with a straw. Ways of use: Lemons should be consumed fresh. The gathering time extends from autumn to spring. – Citron tree(Citrus medica L.): Very similar to the lemon tree but of more and more rounded fruits, thicker bark and sourer juice. It usually reaches between 3 and 5m. 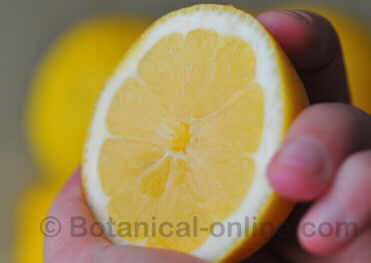 Medicinal properties: Syrup of Citron is stimulant, perfuming and sweetener.